Emily Case, right, one year after her accident. It’s near the end of May, 2016, as I write this. Emily Case, my younger daughter, graduates from U.C. Santa Cruz on June 12th. She’s prepping for graduate school, entering a Ph.D. program in archaeology at Arizona State University. But for a brief time in 2014, I wasn’t sure this would happen. I wasn’t even sure she’d live through a catastrophic accident resulting in traumatic brain injury. 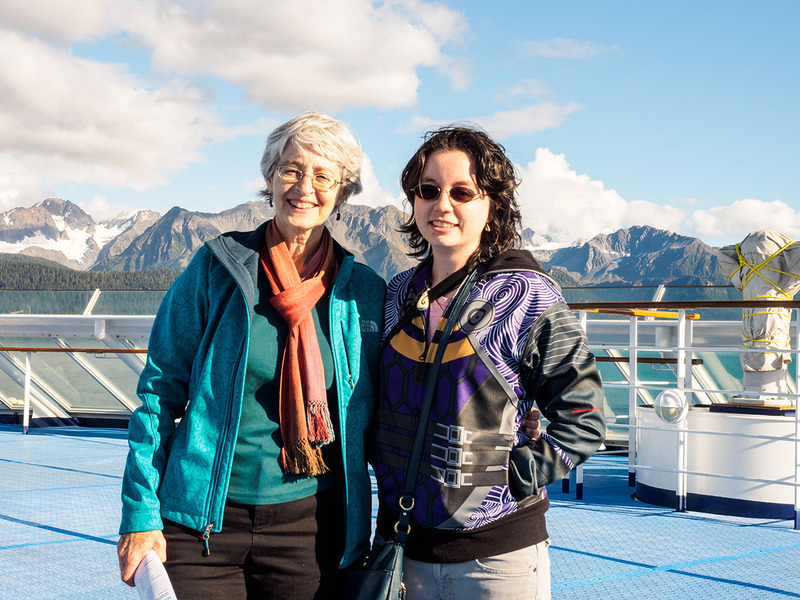 She recovered amazingly quickly, and persevered, returning to college the quarter following the accident. I’m incredibly proud of her accomplishments and how her positive, no-nonsense attitude never wavered. I attribute her survival to the fact that she wore her cycling helmet when she had her accident. So I’m republishing this story, because I feel it’s important. It’s the phone call you never want to get as a parent. 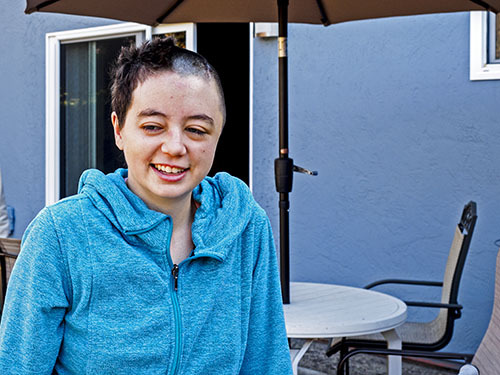 “Your daughter, Emily, is at Stanford Hospital,” the woman’s voice said in the earpiece. “She was airlifted here,” came her response. As I ran around grabbing stuff — e-book reader, water, messenger bag — I called my wife, Jan, who was in New York City visiting relatives. She wanted to know what happened, but I had no information beyond the phone call. I told her I’d call as soon as I knew. The story ends happily. Emily had been riding her bike down the hill from U.C. Santa Cruz, anxious to get home after her third day as a writing tutor. According to witnesses, a number of deer crossed the road in front of her, and she crashed while trying to avoid hitting a deer; one witness even believed she struck a deer. She suffered a concussion and an epidural hematoma, which is bleeding between the skull and the dura, the outermost casing surrounding the brain. A small artery had been nicked by the force of her head striking the ground. Witnesses called 911, first responders evacuated her to the local hospital. The emergency room there rapidly realized they couldn’t handle her injury, so had her airlifted to Stanford. From the time of the crash to her entry into the OR was less than 90 minutes. It could have been much, much worse. Here’s why. She was wearing her bike helmet. Multiple cracks are visible in the foam just above the straps, and the shell was pretty beat up. If she hadn’t worn her helmet, her injuries would have been substantially worse, possibly fatal. The good news is that Emily’s recovery was incredibly rapid. She was home eight days after the accident, after three days in intensive care and five in a normal hospital room. The concussion symptoms caused severe periodic headaches. Four months later, the headaches still crop up occasionally — she calls them “twinges,” but it was pretty rough early on. Emily, two weeks after the accident. Now she’s back at Santa Cruz, pursuing her anthropology degree. She’s planning out her senior thesis project, has dived back into gaming, playing Dragon Age: Inquisition on her laptop. She’s living the life of a pretty normal college student. That’s because she wore a helmet when it counted. Wow! 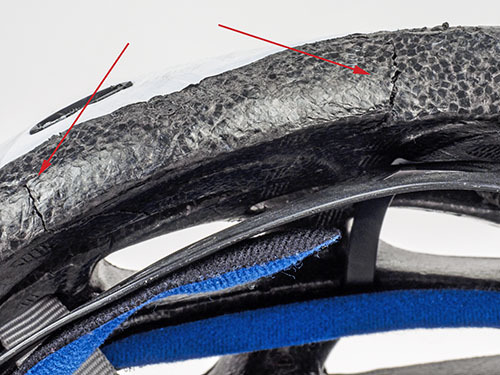 As an avid mountain biker and commuter and road rider, I’ve had my noggin saved a couple of times with a helmet too. I’m so glad she was wearing one. So many people today refuse to wear one! I’m so glad Emily is okay. It must have been quite a scare for you and your wife.